Our family just returned from a trip to Florida. My wife and I had been planning to take a family vacation in October during our kids’ “track out”, the three-week break between the first and second quarters of school. Since the kids (and their dad) have been reading the Harry Potter books, we thought it would be fun to visit the “Wizarding World of Harry Potter” at Universal Studios. But we did not want to tell the kids about it until we had made firm plans. We picked our week to go, and I arranged for time off at work. And then, a week before our vacation, we got news that we would need to attend a funeral in Georgia. Rather than make that long drive twice, once for the funeral and then again the next week for our vacation, we hastily moved our vacation up a week. Since the kids still did not know about our vacation plans yet, we decided to keep it a secret. We told them to pack for the funeral, and we quietly packed an extra suitcase for them. They were so good… stuck at a boring funeral with a bunch of boring old grownups, and yet they behaved so well. After the funeral, a bunch of extended family went out to a restaurant. While we were there, we presented them with a mysterious letter. We are pleased to inform you that you have been accepted at the Hogwarts School of Witchcraft and Wizardry, Orlando campus. This special Autumn Session will take place during the week of October the 8th through the 12th. There is no need to send an Owl as we already know that you are planning to attend. All necessary materials will be provided for you. So we left the restaurant and headed south for Orlando! Although the theme of the trip was Harry Potter and Hogwarts, it was really only a small portion of our week. We spent two days at Universal Studios (one day at the Islands of Adventure and one day at the studio park), one day at Sea World, and two days at Disney World (one day at the Magic Kingdom and one day at EPCOT). We had a blast at all of the parks. But since the motivation behind going was to see the Harry Potter park, I want to go into a little detail about that one section of Universal Studios “Islands of Adventure” park. I was surprised at how little of the Harry Potter theme’s potential was actually developed by Universal. For example, they have a Hogwarts Express train engine, but only as a photo backdrop. I had somehow imagined more exploration of the castle, but I suppose the parks (other than EPCOT) are not really into exploration as much as they are into moving people in a controlled manner through queues and rides. That being said, we still thoroughly enjoyed the Wizarding World experience. The “Harry Potter and the Forbidden Journey” ride was excellent, an “experience ride” where your family-sized cart shakes and wobbles from screen to screen in a 4½ minute ride around Hogwarts. We also enjoyed the smaller roller coaster, the “Flight of the Hippogriff“, which was perfect for the average HP-reading kid (the ride was a mere 60 seconds, beginning-to-end). We chose to pass on the “Dragon Challenge“, a pretty serious-looking double roller coaster. We ate lunch at the Three Broomsticks pub and bought Butterbeer and Pumpkin Juice from a street vendor. I was a little disappointed in the souvenir selections. I was kind of hoping to find a Hogwarts coffee mug… you know… all of the other dads at work have NC State and UNC mugs. But the selection was pretty lousy, so I passed. The shirts were all pretty much very expensive and tacky-looking T-shirts, nothing that I would ever wear — how about a nice golf shirt with a Hogwarts crest on it, for muggle dads? I did buy an over-priced deck of cards, but when I got home, I was disappointed to find that it contained only 14 characters from the movies, not 54. That is, the same Dumbledore picture is on all four aces, same Harry on all four kings, and so on (Fred and George are the jokers). There were lots of Gryffindor and Slytherin items, but very few Ravenclaw or Hufflepuff items, just some crest patches, pins and lanyards. You see, lots of fans choose a favorite house to root for. It was important for us to find some Hufflepuff stuff, since at my daughter’s school, the four core teachers each lead a house, and they actually hold a sorting ceremony to assign the students to houses. But there was not much for us to choose from. (As I write this, I see that there are more items on Universal’s online store than we saw in the on-site shops, and there is more balance among the four houses). So, we were not so tempted to part with our galleons and sickles at the shops. The rest of Universal’s Islands of Adventure was pretty nice. The kids liked the Spider Man experience ride and the Dr Seuss area. At Universal Studios, we focused on the experience rides like The Simpsons, Men in Black and Despicable Me, and skipped the live shows (we should’ve skipped ET, considering the long wait). Sea World had some great shows, with lots of trained animals of every kind. The Disney Magic Kingdom was like visiting an old friend (October is a strange month to visit though, because at night the park transitions to a lively Halloween party, and day guests have to leave). EPCOT, as always, struck a nice balance between “rides” and “exploring”. We had a great week in Florida, and we thoroughly enjoyed each of the parks. 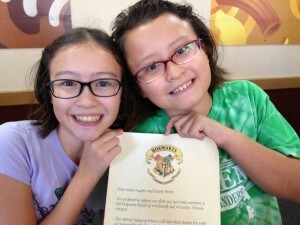 But both girls agree that the Universal Islands of Adventure was their favorite… because of Harry Potter, of course. Their mother preferred Sea World, and I am split between the Magic Kingdom and EPCOT.